Home Diagnose yourself Nail changes – clues to some serious diseases!! Nail changes can give us important clues to some very important underlying systemic diseases. Identifying these changes and correlating them with the patient’s symptoms is very important. A normal nail is pinkish in color with a nail bed which is whitish and forms a slight angle with the fingers and toes. Clubbing of the nails refers to the sponginess and loss of the angle between the nail plate and the finger or toe. Clubbing of the nails may be seen in some families without obvious cause. 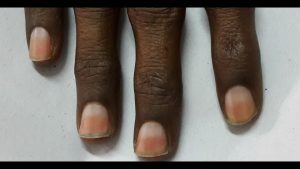 However, in individuals with normally shaped nails, develop clubbing later in life, a search for an underlying systemic disease may be logical. The following are some of the diseases which have been associated with clubbing. Infection and inflammation of the cardiac valves is called infective endocarditis. Patients with infective endocarditis usually have a prolonged state of fever and have normal laboratory workup. Infective endocarditis is more common in patients who have rheumatic heart diseases and those with artificial cardiac valves (prosthetic valves). Diagnosis is made on echocardiography and blood cultures and sometimes serological tests are needed. Treatment is with antibiotics for four to six weeks. patients who have congenital heart diseases with defects in oxygenation may develop clubbing of the fingers and toes. The prime example of cyanotic congenital heart diseases is tetralogy of fallott. These patients, because of a prolonged hypoxic state, usually have high levels of hemoglobin in the body (secondary polycythemia). Diagnosis is usually made early in life with echocardiography. Individuals are usually advised surgical correction of the defect. 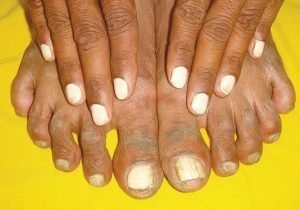 In patients with patent ductus arteriosus, there is differential clubbing of the toenails with sparing of the fingernails. This is one of the serious conditions associated with clubbing. Patients may present with weight loss, skeletal pains, cough, and hemoptysis (coughing out blood). Patients may have non-resolving pneumonia or fluid in the peritoneal cavity resistant to treatment. bronchiectasis is the permanent dilatation of the airways. This leads to defective mucus clearance and repeated infections. Patients have a long-lasting cough with a copious amount of sputum production which may at times contain blood. Pus collection in the lung parenchyma is called as lung abscess while pus collection in the pleural cavity is called empyema. 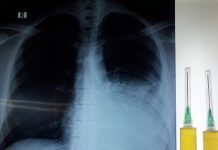 Patients with lung abscess have very foul smelling sputum production along with swinging fever and chest pain. Patients with empyema have a high-grade fever and chest pain with shortness of breath. Idiopathic pulmonary fibrosis is a disease of elderly patients. These patients have a dry cough with progressively worsening dyspnea and clubbing. Inflammatory bowel diseases include ulcerative colitis and Crohn’s disease. In both these conditions, patients present with bloody diarrhea and abdominal pain. Diagnosis requires colonoscopy with biopsy. Treatment is aimed at immunomodulation. Cirrhosis: fibrosis with regeneration of the liver parenchyma is called cirrhosis. Cirrhosis is one of the most prevalent conditions worldwide. Individuals may develop ascites (fluid in the peritoneal/ abdominal cavity), encephalopathy and bloody vomiting. These include tuberculosis, HIV infections, and graves disease (also called thyroid acropachy). Hypertrophic pulmonary osteoarthropathy is another condition with clubbing and thickening of the periosteum of the distal phalanx. It may be misdiagnosed as arthritis initially. it may be idiopathic or associated with lung cancer. Koilonychia or spoon-shaped nails as the name suggests is the flattening or loss of convexity of the nails. In severe cases, the nails become concave shaped. 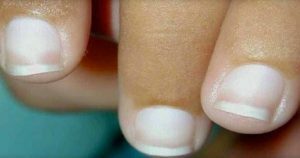 These types of nails suggest an underlying diagnosis of iron deficiency anemia. Patients with iron deficiency may present with progressive pallor, shortness of breath on exertion, palpitation, headache, and craving for non-food items (PICA). 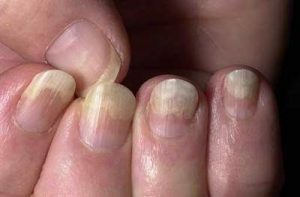 Leukonychia or white nails is indirect evidence of reduced albumin (hypoalbuminemia) and proteins (hypoproteinemia) in the body. Hypoalbuminemia and hypoproteinemia may be found in malnutrition, malabsorption, nephrotic syndrome, and liver diseases. Patients with liver diseases may have associated pruritis which may lead to shiny nails as well. Leukonychia should be differentiated from the common findings of white lines on the nails or milk line which usually do not have any clinical significance. Red vertical lines or splinter hemorrhages under the nails develop when microhemorrhages occur under the nails. These hemorrhages develop when the vessels are fragile as in vasculitis or when clots travel from the heart and block capillaries. Thus, splinter hemorrhages are usually found in infective endocarditis (infection of the heart valves) and when emboli travel from the heart to distant parts of the body. 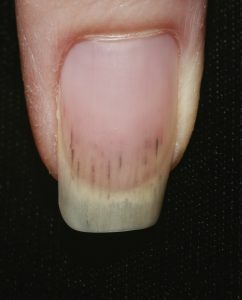 In these type of nails, the white area of the nail i.e the nail bed occupies half of the nail. 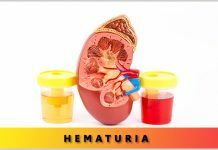 This is most commonly seen in patients with kidney diseases and especially those on hemodialysis. These nails are almost similar to half and half nails but the whitish area occupies up to 80% of the part. These nails are common in patients with liver diseases, diabetes, kidney diseases and patients with congestive cardiac failure. These are horizontal depressions in the nails suggestive of transient growth cessation of the nails. These may also be found in hypocalcemia, coronary occlusion, malnutrition, and trauma. 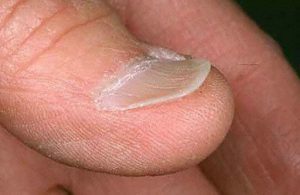 Separation of nail especially the distal part of the nail from the nail bed is called onycholysis. It can occur in local skin conditions like fungal infections but can also be found in connective tissue disease, hyperthyroidism, and psoriasis. 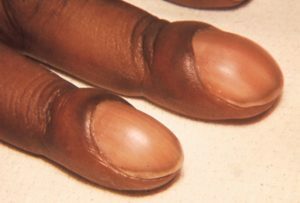 Pitting of the nails is seen in psoriasis and fungal infections. 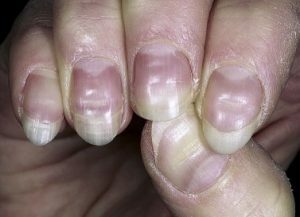 Nail diseases can be a clue to serious systemic diseases. Finding the underlying condition is of utmost importance to prevent the patient from long-term disabilities. Next articleNSAIDs/ Painkillers are not chocolates ! !